Of Taranaki and Te Āti Awa descent, Te Ua was born in Waiaua, South Taranaki, in the early 1820s. In 1862, he established a new religion, Hauhau, based on the principle of pai mārire – goodness and peace. But most settlers viewed Hauhau as a fundamentally anti-European religion, synonymous with ‘violence, fanaticism and barbarism’. Te Ua was influenced by Christian missionaries after being captured by Waikato Māori in 1826 and taken as a slave to Kawhia. Here he became familiar with the New Testament, especially the Book of Revelation. He was baptised by the Wesleyan missionary John Whiteley. He returned to Taranaki around 1840 where he served at the Wesleyan mission station at Waimate. By the 1850s he was actively involved in Māori opposition to land sales. He fought against the government after the Taranaki war broke out in 1860, becoming a strong supporter of the Māori King movement. Te Ua later baptised the second Māori King – giving him the name Tāwhiao. In 1862 Te Ua had a vision in which the archangel Gabriel instructed him to lead his people in 'casting off the yoke of the Pākehā'. The birthright of Israelites (the Māori people) would be restored in the land of Canaan (New Zealand), and following a day of deliverance the unrighteous would perish. The organisation and teaching of the church was set out in 'Ua rongo pai' (Ua gospel). He called his church Hauhau because Te Hau, the spirit of God in the image of wind, carried the niu (news) or prophecy to the faithful. Te Ua considered his teaching to be Christianity ‘purified of missionary error’. In 1864 Te Ua took the spiritual name Haumēne or ‘wind man’. Pai Mārire and Hauhau became interchangeable labels for this new religion. A 'Niu pole' with three flags was a prominent aspect of Hauhau ceremonies. The 'Riki' flag or pennant was a war flag, while the 'Ruru' flag represented peace. The relative positions of these flags on the Niu pole indicated whether the spirit behind the gathering was peaceful or hostile. A third flag represented the priest conducting the ceremony. In April 1864 the preserved heads of six British soldiers killed in an ambush at Ahuahu in Taranaki were presented to Te Ua. He accepted these as a symbol of the victory of the righteous. Fighting involving Hauhau followers at Te Morere and Moutoa Island raised the fears of many Europeans. Governor Grey had declared Hauhau practices 'repugnant to all humanity' and declared that it was to be suppressed by force if necessary. Against a backdrop of war and land confiscations Hauhau disciples travelled around the North Island carrying the message from the west coast to the east. Civil wars broke out as factions within some iwi opposed the new religion, believing that it challenged their sovereignty. The killing of the Anglican missionary Carl Völkner at Opotiki in March 1865 by Hauhau followers caused outrage in the settler population as well as sparking a civil war on the East Coast that lasted until 1872. At the beginning of 1866 a military campaign was mounted by the government to destroy any remaining Taranaki resistance. Te Ua signed a declaration of allegiance at Opunake before submitting to Major General Trevor Chute in early February. He was immediately taken into custody. He was eventually placed under house arrest at Grey’s home on Kawau Island. This move was similar to that employed against Te Rauparaha during Grey’s first term as Governor in the 1840s. The intention on both occasions was to crush the mana of the man concerned. In June Te Ua was allowed to return to Taranaki. His health was in decline and he died in October 1866 at Oeo. 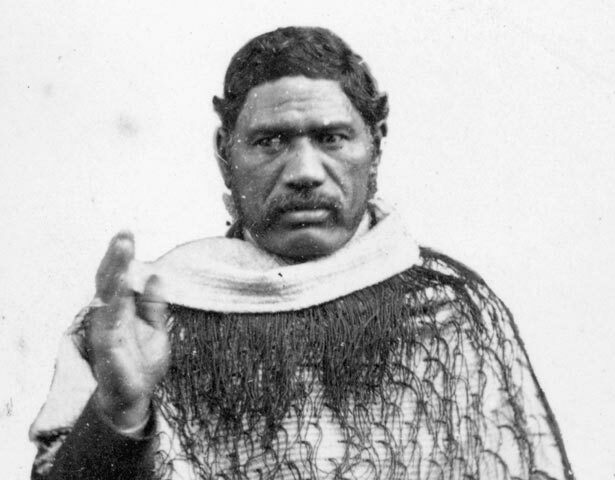 Despite the militancy of many of Pai Mārire adherents, which threatened to overshadow Te Ua’s teachings, he remains a significant Māori religious leader. He enabled Māori Christianity to break from its dependence on the theology and ritual of the missionary church. The tradition of biblical prophecy was drawn on by the Māori religious leaders that were to follow. We have 40 biographies, 7 articles, related to Te Ua Haumēne.